Following a 2 week hospitalization at Shands, my mother, Beatrice, recently had a 4-week stay at Palm Garden. Mom had been at Palm Garden in the past, as well as some other facilities. We are glad we chose to have her return to Palm Garden this time. She was very well cared for, and while she didn’t want to be there, we knew she needed to follow the PT and OT routines if she was ever to get back to her assisted living home. I don’t remember all the names of the team members who worked with her, but three of them certainly stood out: her main nurse Becky, her main PT Susan, and her main OT Peter. While my sister and I have thanked them each personally, I also wanted to let you know how pleased we were to have them as Mom’s caregivers. I know Mom complained a lot about being away from her home, about doing the PT and OT, but these folks remained positive and encouraging, using the motivation of her being able to go home to get her to do whatever was necessary to reach the benchmarks that would allow her eventual discharge. I live several hours away from Gainesville. When I called to see how Mom was doing, Becky was always willing to spend time talking to me about what was going on. 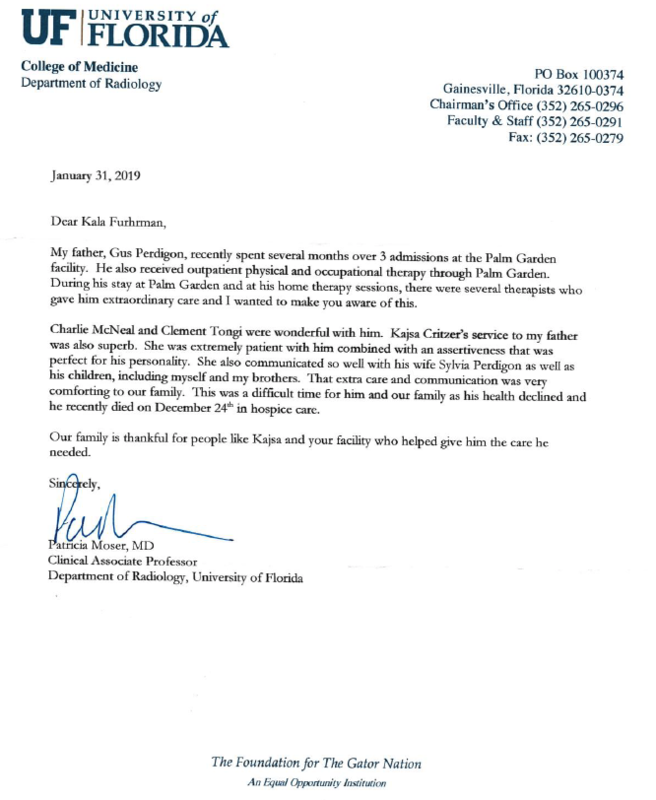 I know she has multiple patients to care for, but I am so grateful that I was able to get information from the person most involved with her direct care. Again, these were not the only 3 staff members who gave Mom TLC. Please let the team know how much we appreciate them. We hope Mom won’t need rehabilitation or skilled nursing care any time soon, but if she does, we will definitely bring her back to Palm Garden.